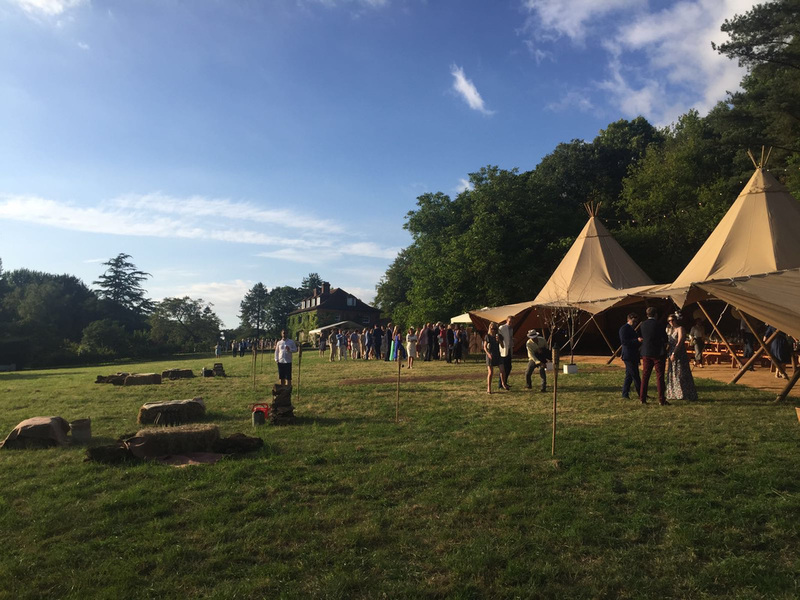 Oakleaf Marquees is the first Dorset-based supplier of large event tipis modelled on those used by the Plains Indians of North America and the Sami people of Scandinavia. 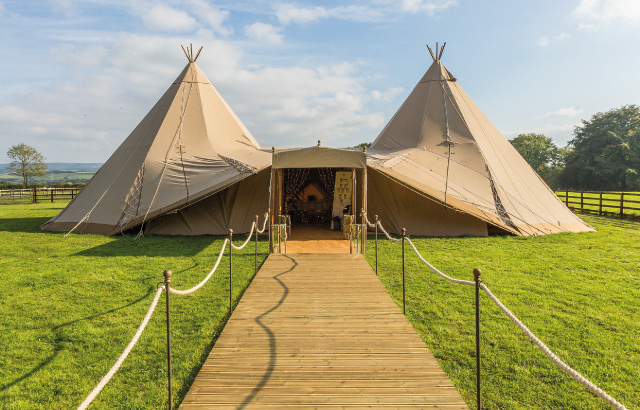 Our tipis are relatively unchanged from their hereditary beginnings but utilise the latest materials and techniques to make them viable for 21st Century use. The design features a nonagon base, symmetrical shape and consists of 80 year old de-barked spruce timbers from the freezing forests of Northern Scandinavia and breathable beige canvas. 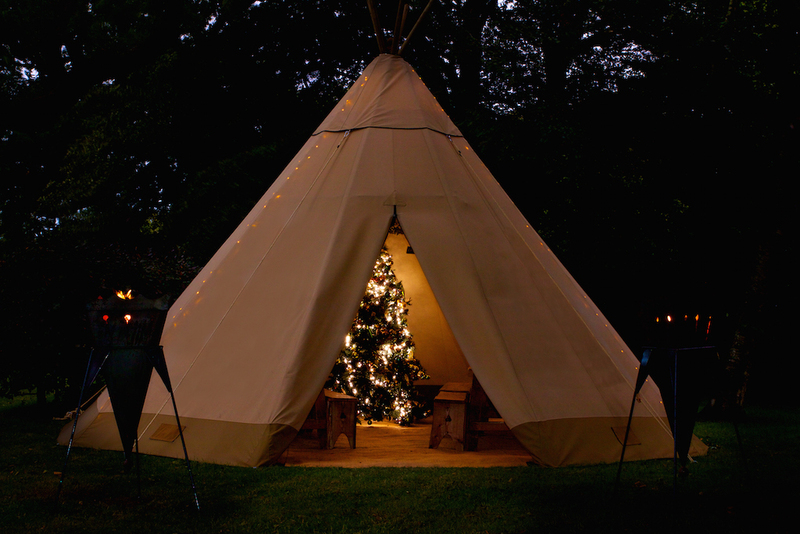 We offer two different sizes of tipi: the Big Hat (10.3m diameter 'sides down' and 13m 'sides up') and the Baby Tipi (6.5m). 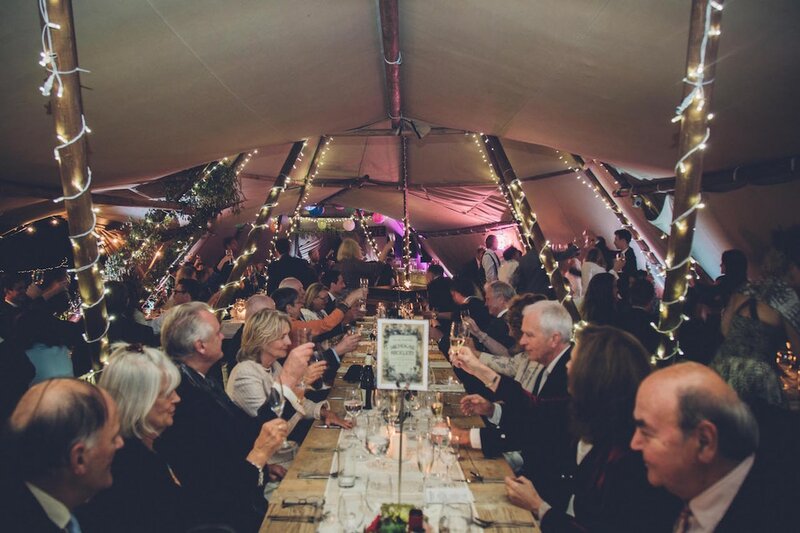 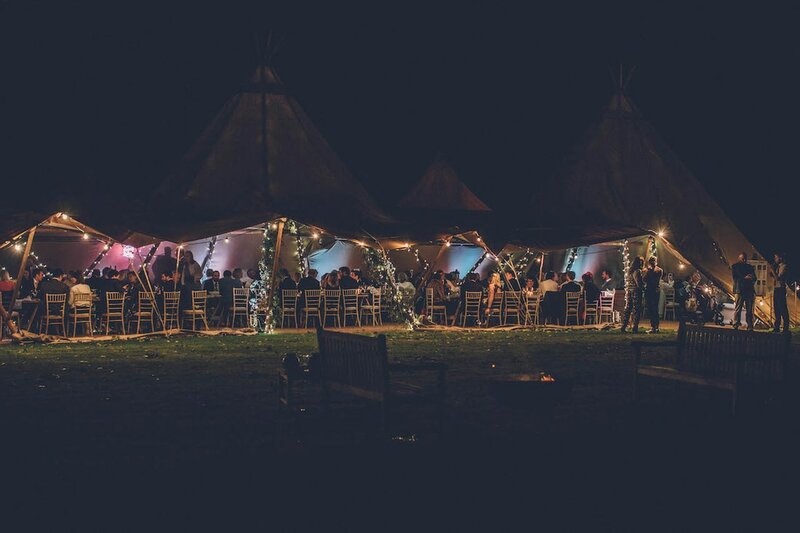 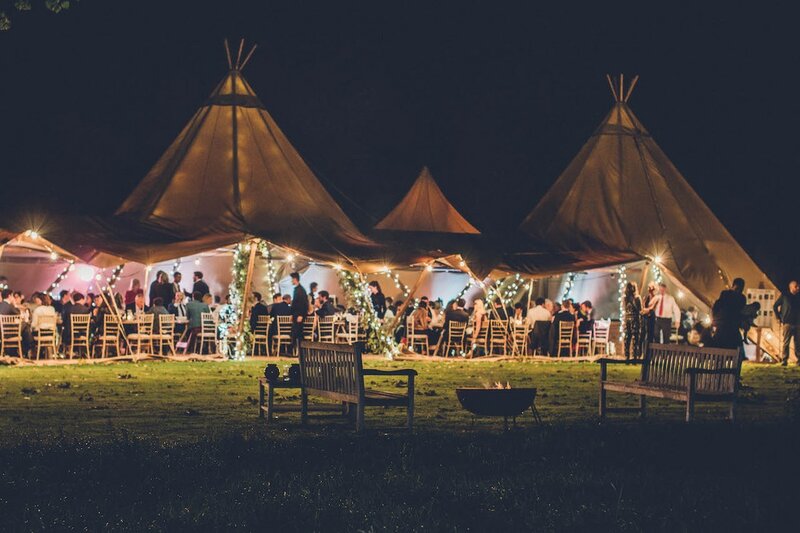 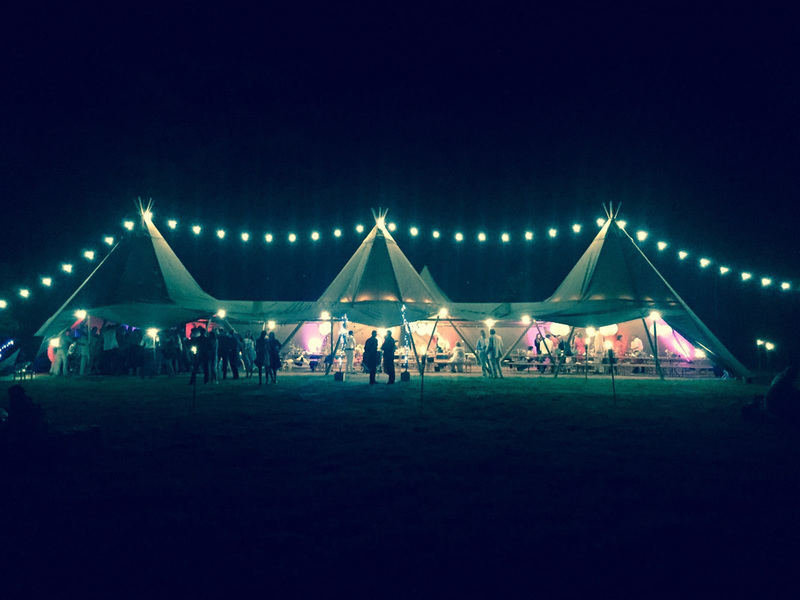 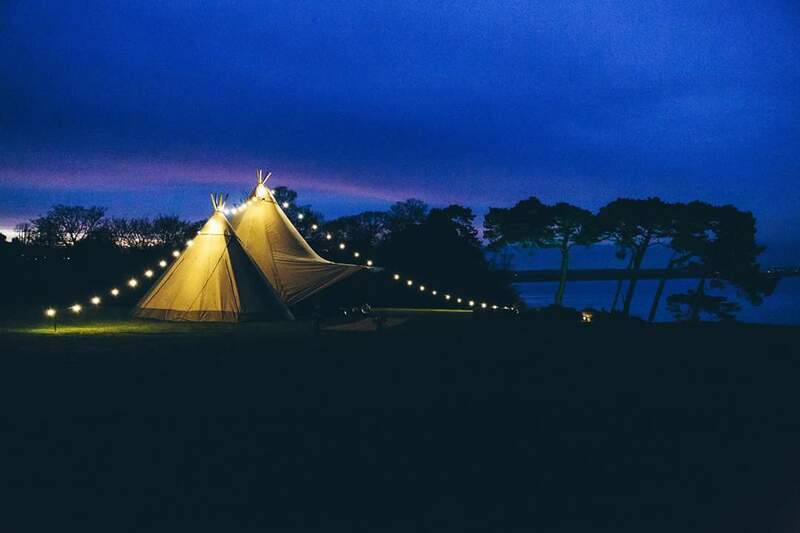 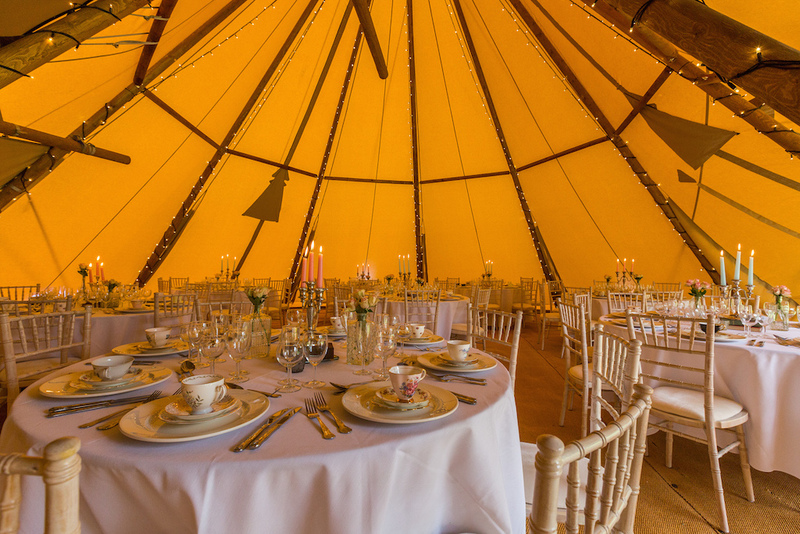 Tipis can be hired individually for intimate garden gatherings and glamping or interlinked to create massive event spaces incorporating dining tables, dance floors, chill-out zones with open fires and bar areas. 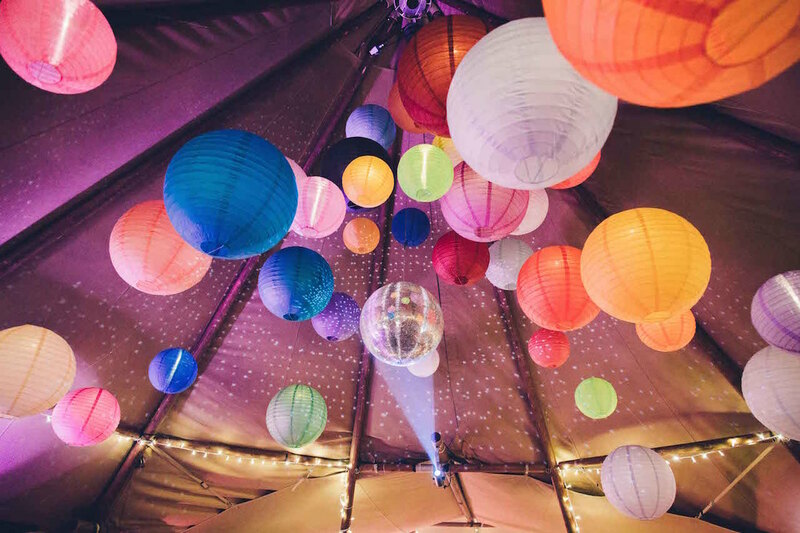 If you're looking for something a little different to a white marquee then look no further. 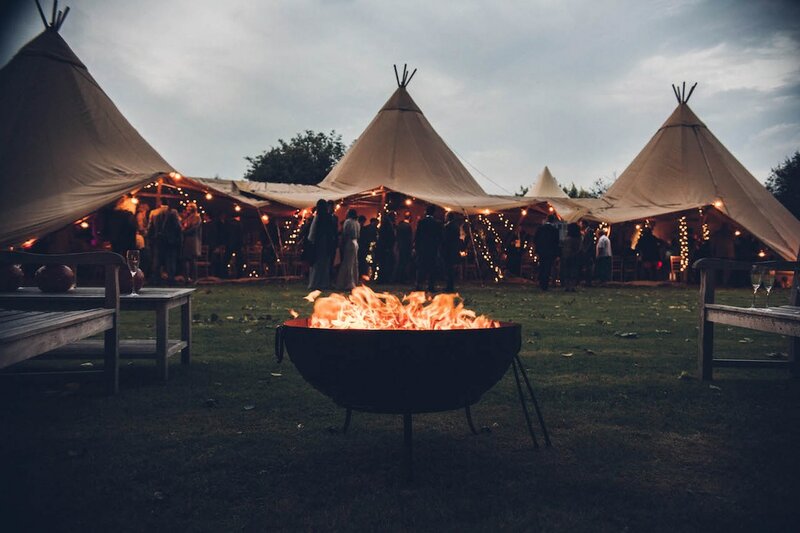 The beige canvas allows ambient lighting such as fairy lights and flickering fireplaces to glow through and contrast beautifully with the night sky. 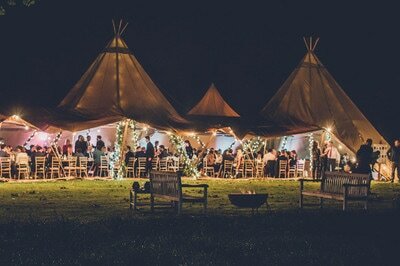 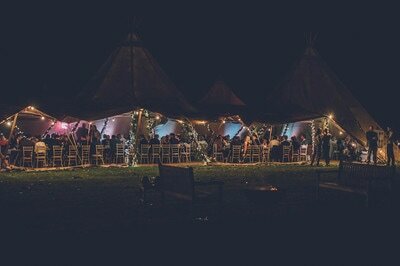 Tipis offer a unique atmosphere which cannot be replicated by other forms of event structure. The English word ‘tipi’ comes from the Lakota word ‘thipi’ which means dwelling. 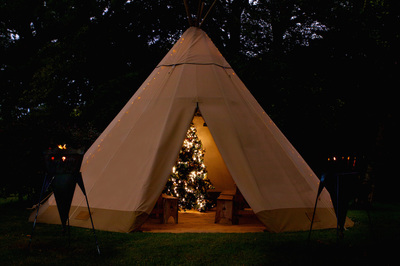 Also known as teepees, they provided warmth and comfort in the winter, cool in the heat of summer and dryness during heavy rains. Used in a variety of other cultures they are called ‘kata’ by the Sami people of Scandinavia, ‘choom’ by the Nenet people of the Yamal Peninsula in Russia and 'chum' by the Khanty tribe of Siberia. Essentially, all are of a very similar design and could be disassembled and packed away quickly when a tribe decided to move on and could be reconstructed swiftly upon settling in a new area. 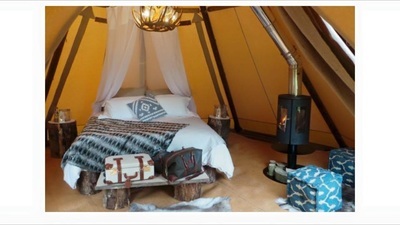 This portability was an important factor to the various tribes with their nomadic lifestyle. A simple conical structure with adjustable smoke flaps and multiple poles, they were covered with a detachable cover historically made of buffalo skins and a canvas door. Simplicity was the key word: the fire created warmth; the hides kept the heat inside and the flaps extracted the smoke allowing for a well-lit and atmospheric cosy home. 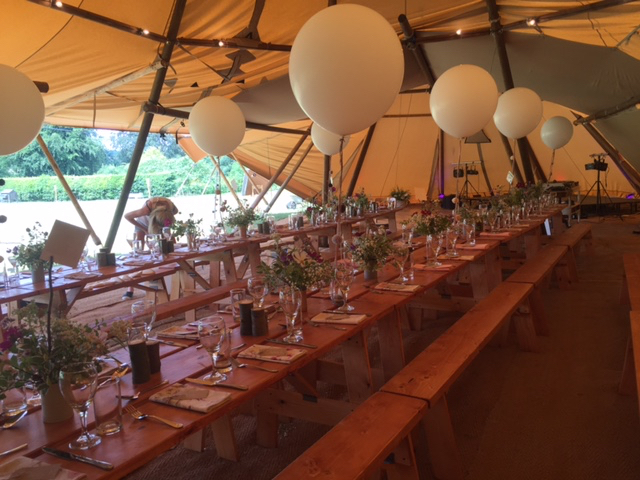 The strong wooden poles used for the construction of our tipis have been sourced from North Scandinavian forests where it is extremely cold and hence slow growing. 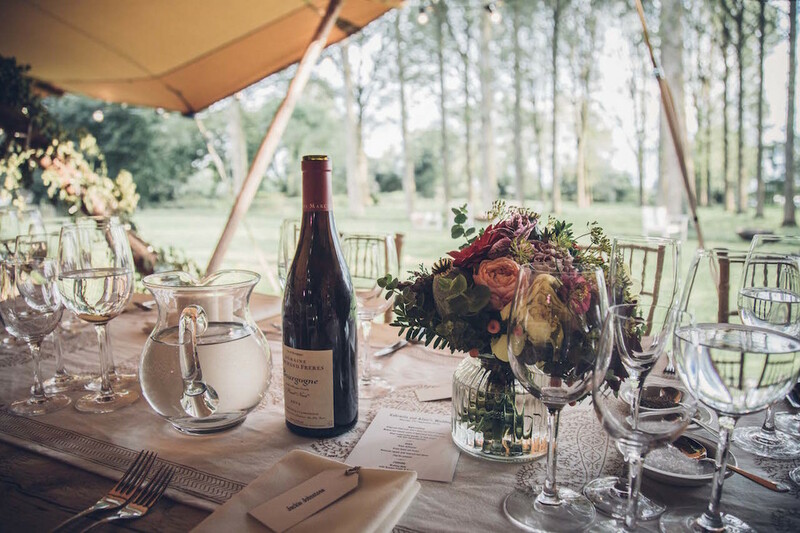 Our timbers are initially chosen in the forests for their straightness and represent the best specimens found in North Scandinavia. Over 80 years old, the poles are de-barked spruce and are light but very strong. 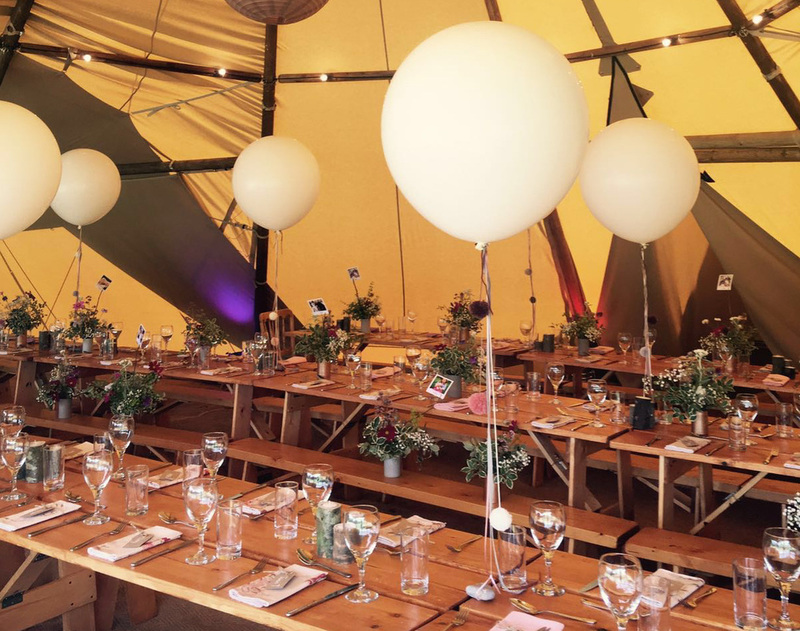 It's due to these qualities that the tipis are more stable than most marquees in high winds as they have huge load-bearing strength and can be erected on all types of soft and hard surfaces. The poles meet British Standards and are 100% consistent in their dimensions starting at 115mm diameter at the bottom with a perfect taper to the top where the diameter is 80mm. 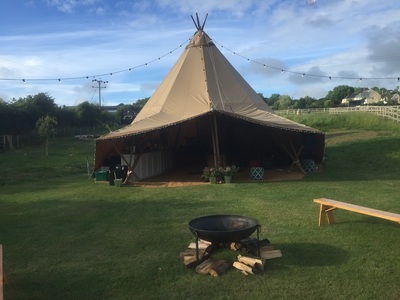 Our tipis feature a durable outdoor fabric that is highly waterproof, weather resistant, moisture regulating and breathable – making it perfect during the heat of summer and cold of winter. 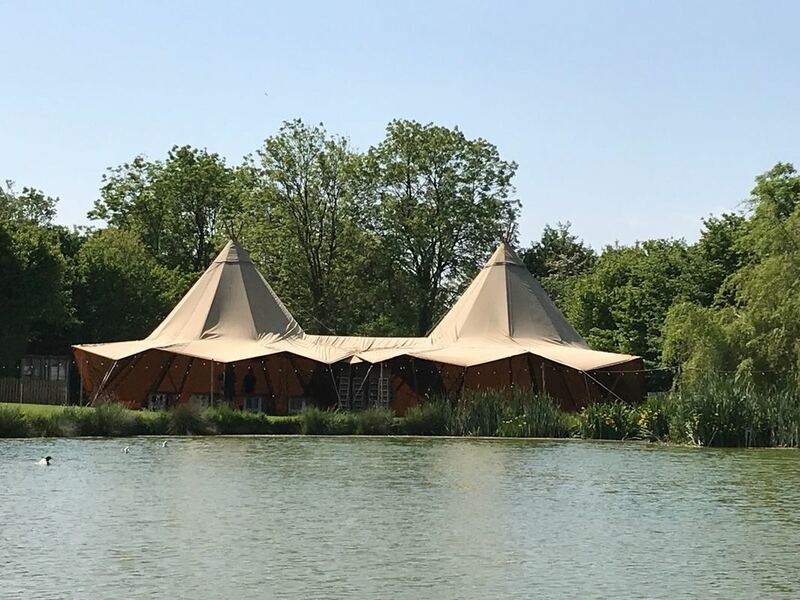 It is also stable, sun protective and colourfast with a non-fouling finish making it a visually stunning product that is also practical. Made of a top-class blend of breathable cotton and synthetic fibre, it can be stretched tight against the rustic wooden poles and can be used repeatedly without shrinking or stretching excessively. 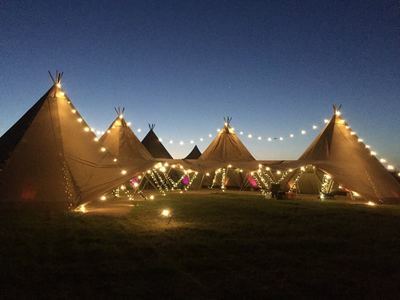 The beige colour of the canvas allows lighting inside such as fairy lights or an open fire pit to glow warmly through it - so externally, tipis look stunning against the night sky. 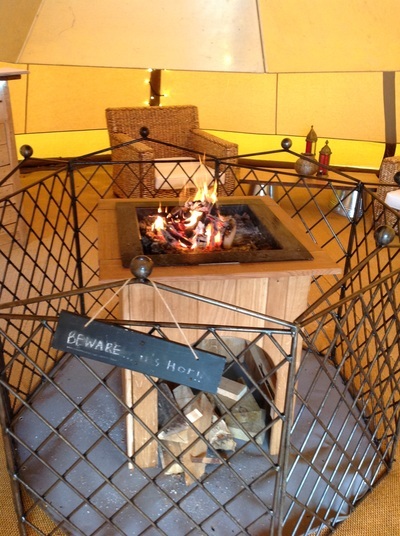 In addition to these unique characteristics the canvas is also flame retardant to British Standards. 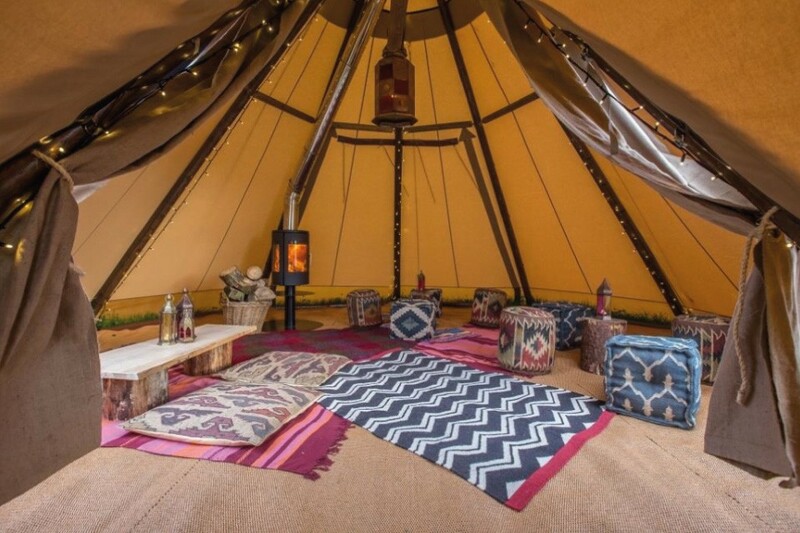 We selected a manufacturer for our tipi range which is as passionate about British made brands and UK manufacturing as we are. They have been awarded the Made In Britain marque which is the official seal of approval to show their products are made in Britain and not outsourced to China and other Asian countries to keep production costs low. By testing and developing all their products here in Britain they can ensure control over quality, design and materials. 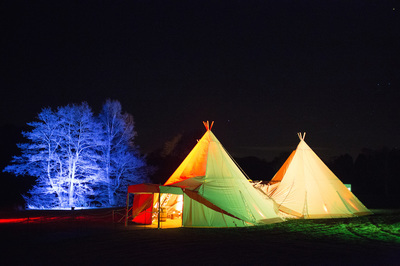 Furthermore, they do their bit to help keep skills, crafts and innovation alive whilst supporting Britain's position as the design centre of the world.